Again, one of the best things about blogging is tapping into the Disney online community and all the friends that are to be made there. I have new friendships, collaborations, and reconnected with old friends. ~Beth: Our newest Minnie Mom, with her own blog, Pursuing the Magic, creator of Magical Blogorail (a project in which I happily participate) and contributor to even more sites. Beth is one busy lady and I am so happy to have gotten to know her. I always marvel at how much she can accomplish. 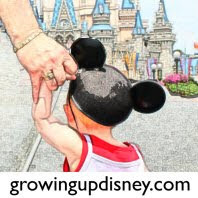 She's adding her experiences of traveling to Walt Disney World with three small children and a bunch of other family members to our Minnie Moms posts and her own guest writing. ~Bruce: He's the creator of Unknown Magic Within Walt Disney World. We became friends through twitter and luckily for me, he's had a couple of articles that didn't fit his theme and he shared them with me. He's a super supportive friend and I've enjoyed watching his blog develop and expand over the last year. I can't imagine how many photos he must have of WDW. Seems he has a shot of everything! Please check out Bruce's past guest posts. ~Corby: She's a sorority sister of mine from college and we reconnected through Facebook. I've been thrilled to chat with her again and I tell ya, her enthusiasm for WDW jumps off the screen in her writing. Not that I can take credit for it, but Corby connected with Kelly and is now a vacation planner with Travel with the Magic. Corby has written some wonderful guest posts and I am proud she's also an active part of our Minnie Moms. ~Heather: The only person I know with her own theme song. Ok, so that was in the sorority days but she's funny enough to deserve one. Heather is another of my sorority sisters whom I have reconnected over a shared love of Disney. She came to it kicking and screaming, but she's a fan now nonetheless. I was delighted when our travel dates overlapped and we were able to meet up for tea at the Grand Floridian. Heather is a great asset to the Minnie Moms and has written some really helpful guest posts as well. Visit Freeze Ahead Frenzy for her delicious recipes and her personal blog, Pieces of Me. ~Kelly: Last but certainly not least, Kelly has supported Growing Up Disney from early on. She's the owner of Travel with the Magic and an Authorized Disney Vacation Planner. (Did you know their services are free to you? And they can usually save you money!) Kelly contacted me shortly after GUD got started and suggested we do a link swap. I didn't even know what that was yet but after a phone conversation with her, I knew this was a woman whose business I wanted to back. Kelly has helped us grow in many ways and I really hope we've sent some folks her direction. Chris and I have each booked vacations through her and recommend her to our real world friends. Lucky dog, Kelly gets to visit WDW and Disney Cruise Line frequently and has shared some interesting articles here. She also has her own blog featuring Disney news and deals. You are so sweet! I love your blog as you know and sharing the opportunity with the rest of us to participate is so appreciated! Thanks, Amy! It's been so much fun to reconnect through our love of Disney! Thank you for the opportunity to do one of the things I love most, chatting about WDW! ;) Happy Blogoversary to the Growing Up Disney team! Ha you nailed me to a T! And yes I do still have a theme song, in my married with children status. Looking forward to con't to write for the Growing Up Disney Blog. Trying hard to convince Bill we can't do WDW again this year with all our expenses... we will see.